I thought I was missing something! But I second-guessed myself and thought I was off by a week or so, and didn’t actually "research" myself so…there you go! From the week of the 5th, I’d wound up picking up Prodigy. #1, though I’ve yet to read it, unfortunately. 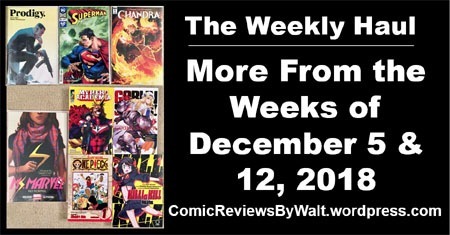 And from the week of the 12th, Superman #6 and Magic the GDathering: Chandra #1. 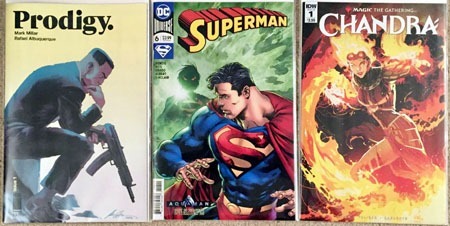 I ended up binge-reading Superman #s 2-6, which probably made it a lot more enjoyable than chunk by chunk as an issue came out; though I’m "curious" about where things go from here, feeling a distinct ’90s vibe…but not in a good way, despite my usual love of ’90s stuff. And Chandra #1 I was curious about, and though this thing wasn’t horrible, it mostly felt like it was just simply "Look! Look! Chandra does stuff!" without much of a driving plot or setup…and no real context for where this story is supposed to take place within Magic lore. Going back also to the weekend between the 5th and 12th…a visit with friends prompted some purchasing. Firstly, we stumbled across Marvel Rising (the animated pieces) that we ended up watching in full. That prompted me to be interested in actually (finally?) checking out this Ms. Marvel character based on actual exposure rather than "hype." Some survey/binging of anime and discussion of same (as well as curiosity thanks to some reviews of figures over at FigureFan Zero) led to these other purchases. 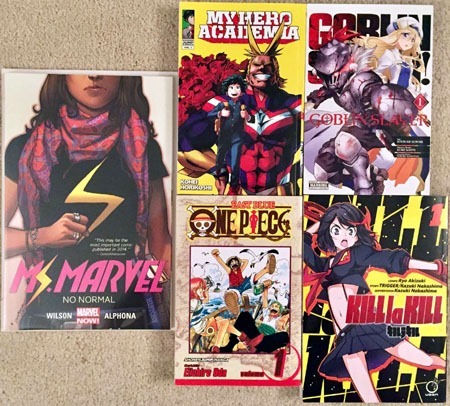 First volumes for four manga series…My Hero Academia, as well as its anime series. We watched and discussed some rather disturbing stuff from Goblin Slayer, and one friend also specifically pointed out Kill la Kill, so since I saw the first volume for half price, grabbed that. And thanks to those figure reviews mentioned above, and this first volume being available for half-off, One Piece. I have no idea when I’ll get around to actually reading these manga volumes or even Ms. Marvel; though the latter might happen sooner. I’ve also discovered that my nook app can now handle graphic novels and such bought through Barnes & Noble, and on a strong recommendation purchased the 3-issue War Bears series from Dark Horse that I’m reading amidst other reading. But as these posts are part sharing with everyone else what I’m getting and part "documenting" for myself…this post is largely for me to have record of approximately when I actually got these. I’ll likely cover some of this later in some form.